Inspired by the tulip blossom mixed with bucket bag. With the wide middle compartment makes it easy to put on much loved items so you can carry it anywhere. No more time wasting with the zipper, the use of it is perfect for everyday use because you can put on a long purse, smartphone, power bank, umbrella, bottle water, scarf and glasses in easily. There is also a zip closure on the side of the bag for you as well. 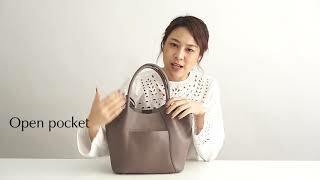 The outside of the bag has an open pocket to put in the parking card, napkin or a smartphone. It is a very simple but elegant bag from VERAPARISbag, don’t you think? If you like simplicity but just want to add some gimmick to the bag, we recommend Tassel, a two-tone tassel made of genuine leather. The first color is the same color as the bag. Another color is a Champagne Gold Metallic with the size of 4cm wide, 11.5cm high. Tassel can be used to mix and match with COLE, VENTI TOTE as well. Material – NICOLE is made from genuine cowhide leather (Cow Pebbled Leather), which is easy to care for. As Alcantara fabric is attached to the leather, the inner lining is the same color as the leather, making the bag look exactly the same and gorgeous. Size of bag: lid width 33 cm. (base width 26 cm.) x height 22 cm. x bag bottom 11 cm. x handle height 19 cm. Easy to put on your shoulder or arm perfectly. Available in 5 mix and match colors as Ash Green, Taupe, Red Wine, Black and Hazelnut. Special price when add to this bag to cart together with tassel only 5,500 Baht from 5,900 Baht.